This is Jack a 6 year gelding. 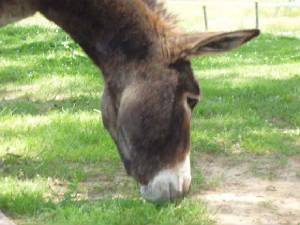 Jack was actually our first donkey and has a special place at the farm. I first saw Jack advertised in our newspaper. Joking around, I said to my grandparents "Can I call?" and sure enough I could. Well we decided to go down there and see him. Well by the time we got there it was about dark and it started to rain. As soon as I saw him, I knew he was going home with me, that night we wrote out the check and we got him. Now Jack is now living out with his friends. 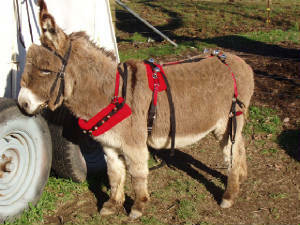 Jack is a very smart donkey; he can lie down and pull a cart. Sometimes he invites him self in to the house for a little snack. 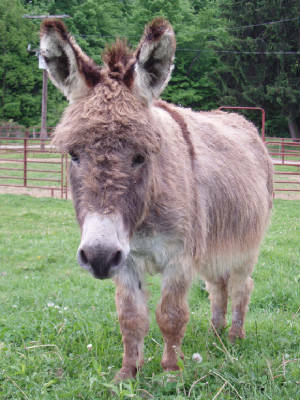 Our second donkey was and still is Coco. We have decided to keep Coco as a stud, so that we can bred our miniature horse, Mischief and have our own miniature mule. 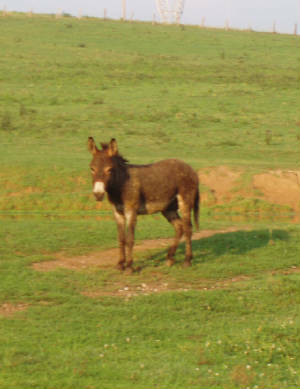 Coco has since sire 3 miniature mules, Bonnie, Clyde and Shortcake. Coco has been gelded and is now living as a deer guardian, Being the little sneaky donkey Coco is, he kept sneaking in the neighbors pasture and then on to the road. We just could have that happening, for the fear of him getting hit by a car. So he now about 30 minutes away, gaurding a herd of about 60 white tail deer.